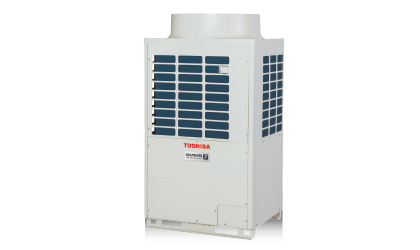 Toshiba VRF Top Discharge Smms -7 , Commercial Air Conditioning System Online in India. At Toshiba we realize that the urban landscape is changing. That’s why we created the SMMS7 – a tailored cooling solution that provides optimum air-conditioning without cutting corners. While being environment friendly, it also takes your area of application into consideration, delivering ultimate efficiency for your building. Powered by the 7 senses of Smartness that give 7 exceptional benefits, it’s the VRF system built just for you. Enhanced efficiency at full load and part load 26% higher efficiency at 50% load with EER as high as 7.2. HFC-410 A Refrigerant Over 20% reduction in refrigerant quantity. Footprint reduced by upto 24%. 88 KG reduction in weight. Operates at upto 52ºC ambient temperature. NFC wave tool function for installation and troubleshooting simplified refrigerant circuit. 200% diversity. Total piping length of 100 M.
Diamond like carbon coated 2 stage vane, lesser friction and longer life. Small animal protection.